Doesn’t that look good? I’ve wanted to make this cheese-less Cheesecake for a long time. 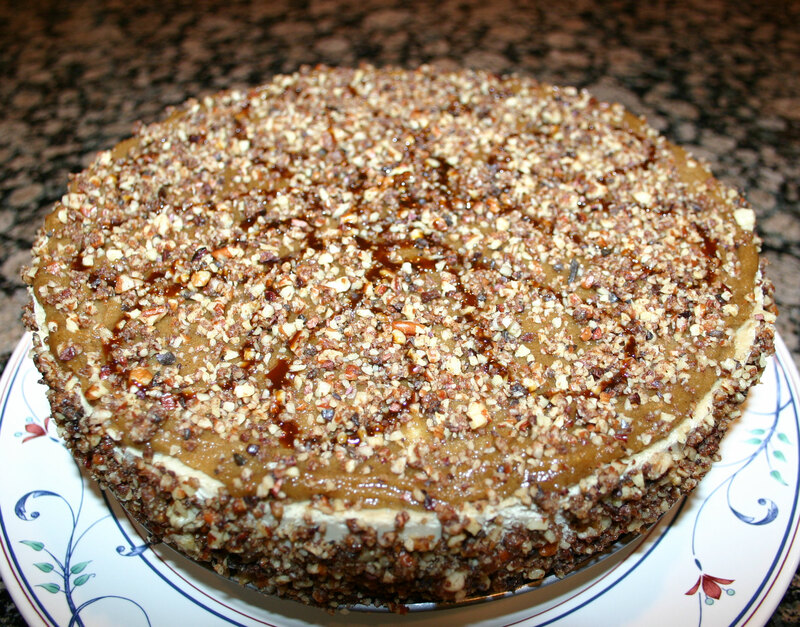 The first time I saw the picture in Sweet Gratitude I was sold for I LOVE caramel. 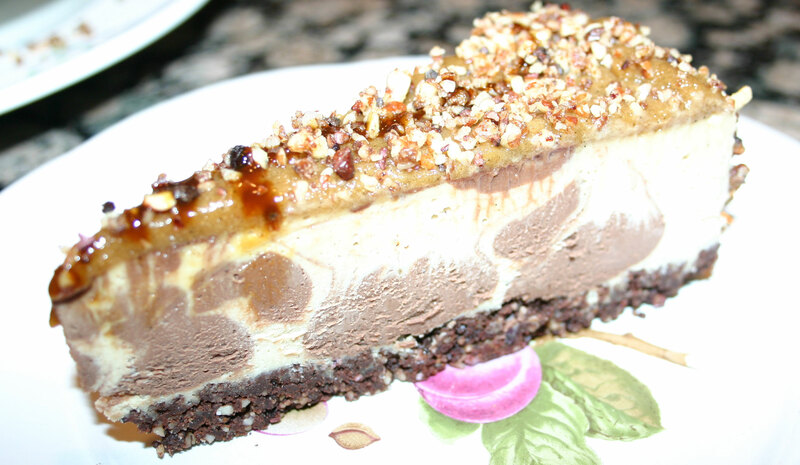 And the picture they show has a light caramel top with chopped nuts and cacao nibs over a creamy ½ chocolate filling with a dark crust, that all looks like heaven on earth. That slice looks really close to what they published! The bottom crust is basically a combination of pecans, cacao powder, dates and a little vanilla. The filling is soaked cashews, agave, almond milk, lemon juice, Yacon syrup and coconut oil. The difference between the light and dark filling is that the dark has cacao powder and a little more vanilla added. Spread over the top is, by far the best, ‘caramel topping’. It’s macadamias, agave, cacao butter, vanilla and a little almond milk. Finally, on the back side and top, you’ll find chopped pecans, cacao nibs and a little Yacon syrup. 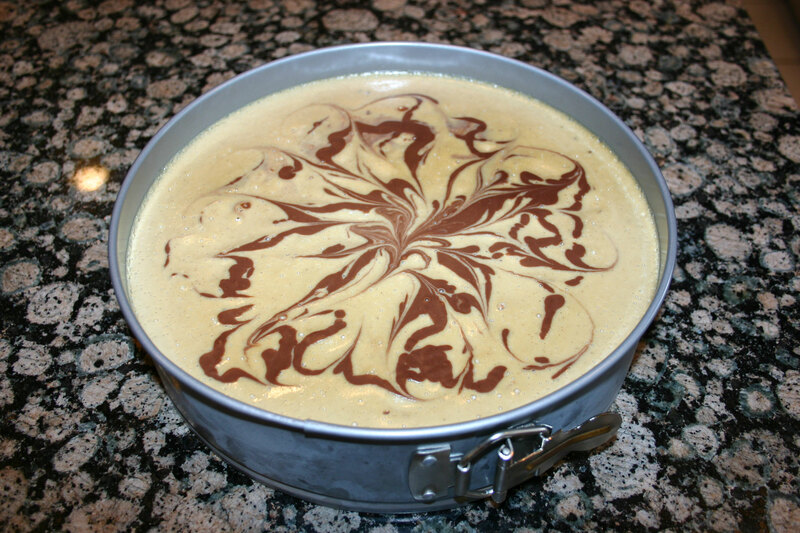 Chapter 4, which is all about cheese-less Cheesecakes has a short write-up about how to make the swirl. What it really comes down to is mixing up two contrasting colors (white and black) from the same material. The main ingredients made about seven cups cake batter, and you pour in all but two cups. To that, you add cacao to give it a deep dark color and then pour it in. If you hold the blender high enough above the pie, the falling batter will penetrate what’s already there. As the stream tapers down, you get a light drizzle across the top. Then, you put your magic chopsticks to work – not overdoing it so it doesn’t mix all together (thus losing the contrast). I had to take this before finishing things up. It looked great event without the topping. The final result looks like a party! A big party. It’s a two day project! No, not that it will take you two days, but in order to really do what they outline, you have to let the cake setup. Ultimately, you’ve got to take it out of the form to spread pecans around the outside. To take it out of the case, you’ve got to let it set for hours. Well, that normally takes overnight (unless you know some magic that I don’t). I wish I’d thought more about that before starting this ‘project’ because I really like deserts that I can whip up on less than an hour. Also, I wish they’d created recipes for 7 inch cheesecake forms rather than 10. Ten inch pies are for the diehards that need to eat more than what’s humanly possible. If they keep for three days, I’d be eating slices for breakfast, lunch, dinner and snacks in between! Ultimately, if you love nuts, you’ll love this desert. Some of you might remember that back in April I critiqued a YouTube video by HealingMindN (or his website here or here or … There are a number of places so I won’t list them all) entitled “How to Make Your Own Philosopher’s Stone”. That article can be referenced here. Well, the intent of this posting is to provide an update to what’s transpired with regards to my ORMUs (ORMEs) harvesting quest in the last month. Let’s start with the good news. I am now the proud owner of a new hand operated vacuum pump and filter. I took HealingMindN’s words to heart and ordered one up. It came with a flask and a bunch of filter paper so you’re pretty much set when it arrives. Having never really used one of these filters before, it took me a few tries to figure out how to capture a vacuum that will hold the paper down before adding the ‘dirty water’. That was a while ago, but I remember Googling around until I found a demonstration video that showed someone placing in a bit of water to soften the paper and letting it sit wet for a little while. Then, if you run water through the system the paper will form (mold) over the holes in the filter and draw a little vacuum. Then, you have to carefully take is apart, remove the water and put it back together again. When adding the liquid that you want to filter, you’ve got to slowly add it making sure you don’t draw to much vacuum giving the paper time to settle in place. Once its set, you can really pump out the air and draw the liquid through. Yet it still takes time. You’ll want to schedule for it. Other good news; the article brought me in contact with HealingMindN. If you’re going to copy someone’s work and you have problems, you might as well ask questions of the source, right? Well, things didn’t work out as expected the first or second attempts, thus I asked a few questions. And, as it turns out, HealingMindN is willing to share with people that take the process serious. Editors note: this quote will stand as long as HealingMindN doesn’t object. After watching the video, I was inspired to really give it another go. A couple years ago, I’d mixed up a couple dozen batches, but never got what HealingMindN shows as being so simple. But, in light of this new information, I figured it was time to try again. Thus, I added a Buchner flask and vacuum pump to my collection along with some distilled white wine vinegar, a new bag of Celtic Sea Salt and some fine imported German mineral water. The first thing that I noticed that was different then his video was that the amount of precipitate that formed from my ½ cup salt in water. It barely made it to the 100 ml mark. Having performed the pH swings on sea water before, I knew that all the measurements that he described would not apply to the volume of precipitate that had settled for me. That might have been the downfall for me that first time through. Yet, I continued with the process following the pH meter rather than the volumes that he suggested. By the time I’d filtered the material to ‘harvest’ the M-state, there was next to nothing left (in solution) to react to the vinegar. Nothing like adding a single drop and watching the pH swing 10 one hundredths. Even through the reactions showed that there was next to nothing in solution to actually react with the added base, I still got to experience the runaway pH process. That was interesting and exciting at the same time. When adding the base I added it a single drop at a time and waited for the pH to stabilize. This, as you might imagine, took a while. When raising the pH the acid that you add reacts, but eventually the pH will drop a little showing that it’s reacted and you can add a little more. The first drops of vinegar acted this way, but once I got down into the 10 range, there was a point where the pH simply kept ticking down. I slid the vinegar away from me and simply watched the process. Slowly, tick by tick, the pH lowered. The problem was that the ‘cooper’s pairs’ never became visible. I figured that I’d give it another try and push to get as much precipitate as possible. Here is a picture showing some of the components in my lab. The blue liquid in the left most jar is a calibration fluid. It’s a known mixture that holds a pH of 10.00. I use that to calibrate my pH Metter. And as you can see, the box for my meter is shown just to the right of the calibration fluid. Back left is the water jug from my distiller. Nothing like having distilled water for my hobbies. Back center is the cookie can. Fits a one liter beaker perfect. The two smaller beakers contain Lye water and White Wine Vinegar. The smell gives the vinegar way. The foreground shows a bit of Dead Sea Salt precipitate still in solution. Hanging from the loop in the stand is my feeder when mixing in the mild acid or base. With the second attempt I used a bit more Celtic Sea Salt and a bit more mineralized water. Also, with the first attempt, I filtered the sea water through the Buchner filter which took a really long time. This time I simply used a couple coffee filters. I had the feeling the first time that I didn’t let the Sea Salt rest long enough before filtering and that the filtering process itself was a little to aggressive. Thus I made the modifications. 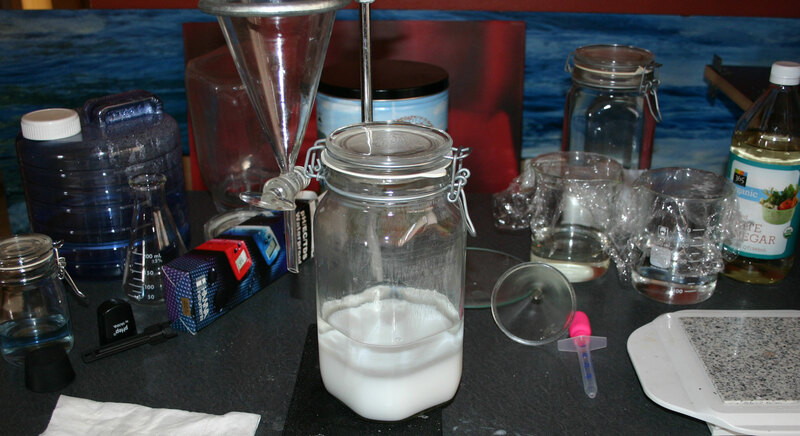 By using a bit more salt, I did get a bit more precipitate, but I also ended up with more water. I figured that I’d simply go with the flow and use a bit more water (during flushing) and observe the results. One result was that the water really didn’t have the saltiness that it should have when you get to the filtering process. And two, I noticed that when I removed the substrate I could add lye water to it and get more precipitate. Getting more precipitate was very interesting to me. That action showed that I hadn’t added enough lye to complete the reactions that should have taken place in the sea water. I should have continued to add and wait letting the water react it’s fullest. I will take my time next time. The filtering process was much easier the second time and, because the pH swings were so extreme the first time through, I diluted the base 50% so each drop would be ½ strength. Again, I went to work lowering the pH. This time, I got no runaway pH lowering. It was at this point that I tasted the mixture and noticed that it didn’t taste salty. My observations – salt may play a role in helping this process occur. In both cases, I noticed that the cookie container really did let the mixture ‘rest.’ I will continue to use this type of shielding as I continue to refine this process. Also, if the M-state is stable when trapped with salt, I would expect that salt will help keep it stable during this refining process. Thus, I will not use too much water next time. And finally, when raising the pH, I’ll keep adding until the lye stops reacting within the solution. I would be willing to guess that not taking the mixture to the ‘limit’ has a counter affect on the end results. I’ve also been to the Asian store a few times looking for HealingMindN’s lye water. Looks like I might have to order it from Amazon. Yet, I’m going to wait a little longer on that and see if I can balance out the water to salt ratio so as to get the runaway pH lowering next time. I have a feeling that’s pretty important. In any case, I’m sure the plants in my garden will enjoy these minerals. Mommy, where does a bee go when it dies? A couple years ago I got interested in following the honey bee die-off problem that has come to be known as Colony Collapse Disorder. At first it appeared that there might be something mysterious going on that caused the bees to disappear. Being open to strange things, I figured I’d listen and see if some reasonable explanation would come along. For if it didn’t, without honey bees to pollinate humanities crops, we’d be in for a big hungry problem in no time at all. Colony Collapse Disorder (CCD) or sometimes honey bee depopulation syndrome (HBDS) is a phenomenon in which worker bees from a beehive or European honey bee colony abruptly disappear. While such disappearances have occurred throughout the history of apiculture, the term colony collapse disorder was first applied to a drastic rise in the number of disappearances of Western honey bee colonies in North America in late 2006. Colony collapse is economically significant because many agricultural crops worldwide are pollinated by bees. European beekeepers observed similar phenomena in Belgium, France, the Netherlands, Greece, Italy, Portugal, and Spain, and initial reports have also come in from Switzerland and Germany, albeit to a lesser degree while the Northern Ireland Assembly received reports of a decline greater than 50%. Possible cases of CCD have also been reported in Taiwan since April 2007. That’s the basic background into the problem. Now, what might be the cause? About a year ago, I stumbled upon a great YouTube video from a passionate woman posting as “beepassionate’s channel”. What she happened to say struck me as a reasonable solution to the problem. So, rather than spelling it all out here for you to read, I’m just going to link in her original video and the followup video that came along 18 months later. (NaturalNews) The great mystery of bee deaths has been solved. Colony Collapse Disorder is poisoning with a known insect neurotoxin. Clothianidin, a pesticide manufactured by Bayer, has been clearly linked to die offs in Germany and France. Although the bee die offs that have occurred recently are more severe, there have been many in the past from the same and similar products. In North Dakota, a lawsuit is pending against Bayer for the loss of their bees in 1995, the result of spraying rapeseed with Imidacloprid. In 1999, the same product was banned in France for use as a seed dressing for sunflowers when they lost one-third of their hives after widespread spraying. In 2004, it was banned for use on corn. Recently, France refused to approve Bayer’s request to sell Clothianidin. Looks like Mother Earth News picked up on this problem. Colony Collapse: Are Potent Pesticides Killing Honeybees? If you want a bigger list of articles, search Google using the string “colony collapse disorder causes pesticide”. The way I see it, this type of problem is money based. Thus, to change it, we need to change where and how we spend our money. Basically, don’t spend your money to buy products from companies that you know are part of the problem. Buy products from companies that are part of the solution. Can I get away with saying that on such a formal blog? I don’t know why I’ve waited so long to start blending Chard. I’ve looked at it for months right next to the Kale and Collard Greens. And I think I’ve been associating Chard and Collard Greens. The last batch of Collard Greens that I munched on had a clear peppery spicy flavor that didn’t seem to mix with anything. I couldn’t see it working in a sweeter smoothie. Well, I felt bold the other day when I saw the Chard on sale for half price. The best part about it was that they weren’t regular bunches split in two being sold half price! That’s a dirty trick that I’ve seen played out on the stores that I know people fall for. Rather, it was the normal size, larger than life beautiful green leaves and firm and fresh. Collard Greens have a mild flavor and are rich in vitamins A, C and K, folate, fiber, and calcium. The best way to prepare them is to boil them briefly and then add to a soup or stir-fry. You can also eat collard greens as a side dish. Just add your favorite seasoning and enjoy! Swiss Chard tastes similar to spinach and is rich in vitamins A, C, and K, potassium and iron. It is best stir-fried or eaten raw in salads. 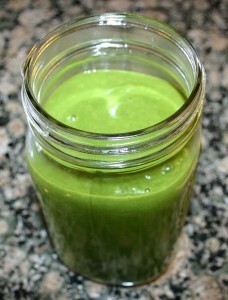 I love spinach and was plenty surprised how similar the taste of chard is to spinach. I also love strawberries but it’s so hard to find strawberries that are actually ripe! When I was a teenager, I worked on a U-pick strawberry farm. Everyday throughout the season, I had access to the best sun ripened berries in the Puget Sound area. If I saw a beautiful berry beckoning to be eaten, I’d always check the crown to see if it was completely red. Ripe berries don’t have any white across the top. Turns out that the berries that end up on the stores sold as ‘fresh’ berries are usually picked green. 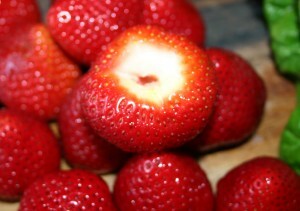 Notice, in the picture, the white core to the strawberry, you won’t see this on a really ripe berry. 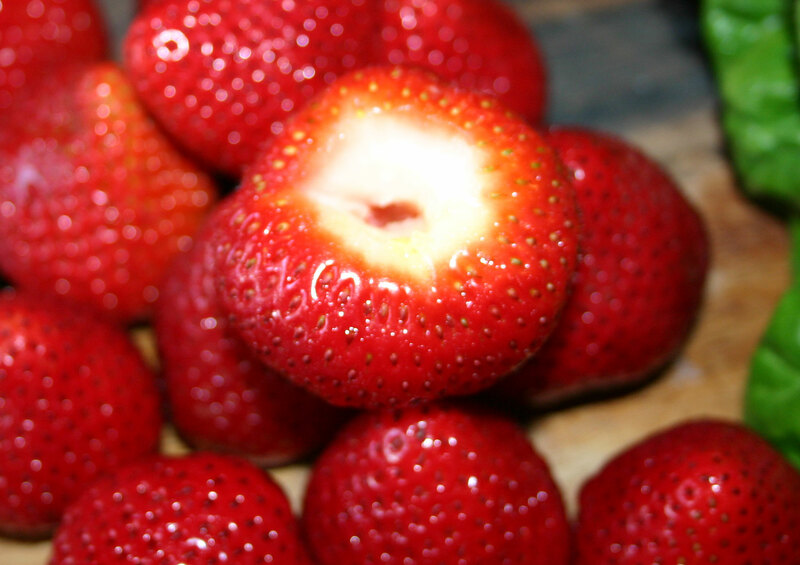 As it turns out, frozen strawberries are usually closer to being ripe then what you usually find fresh. Unfortunately, I don’t have a picture on hand to show a frozen berry (even though I’ve got a page in the freezer). What this picture doesn’t show is the mouth watering smell. I have to admit that the growers have perfected capturing the smell of a strawberry early in the berries development so that when you pick them up in the store, you automatically start to salivate. It’s too bad they don’t taste like fresh picked. 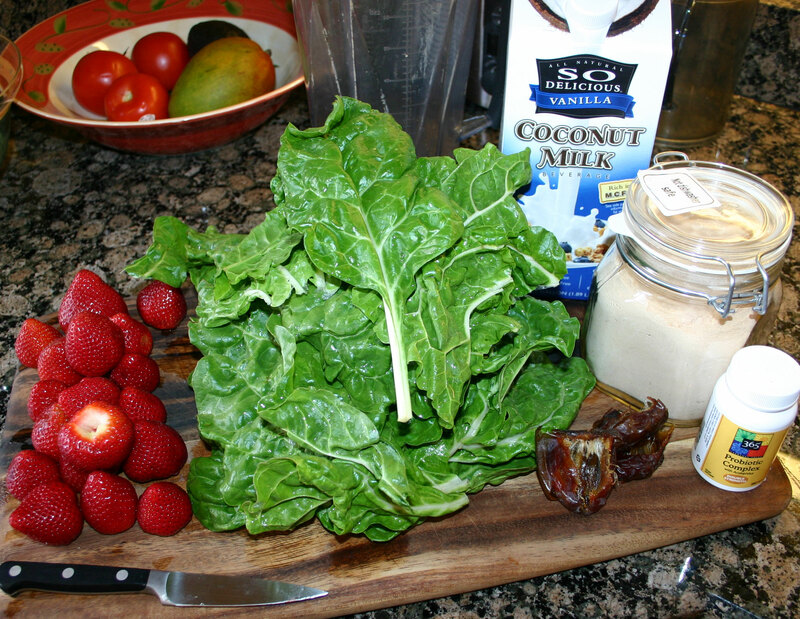 Clockwise left to right: Strawberries, Green Chard, Coconut Milk with added vanilla, lucuma powder, a probiotic complex, and pitted dates. 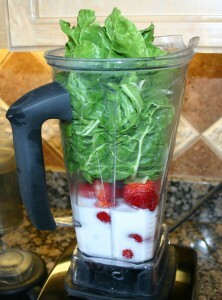 Add the coconut milk to the blender first followed by the fruit and greens. After it’s been ground good and smooth, add the lucuma if it’s not sweet enough. It might be just fine without adding anything more. The funniest part is when you first turn on the blender and you get the wonderful strawberry pink smoothie that, as soon as the greens start to cut, turns a creamy lighter green that you can see with the resulting smoothie picture shown at the top. If I’d known that Chard was as good (or better) than spinach when I first started making green smoothies, I’d probably just be discovering spinach now! Let me know if you give this a try. I’d recommend it to anyone, that’s why I’m posting it here.